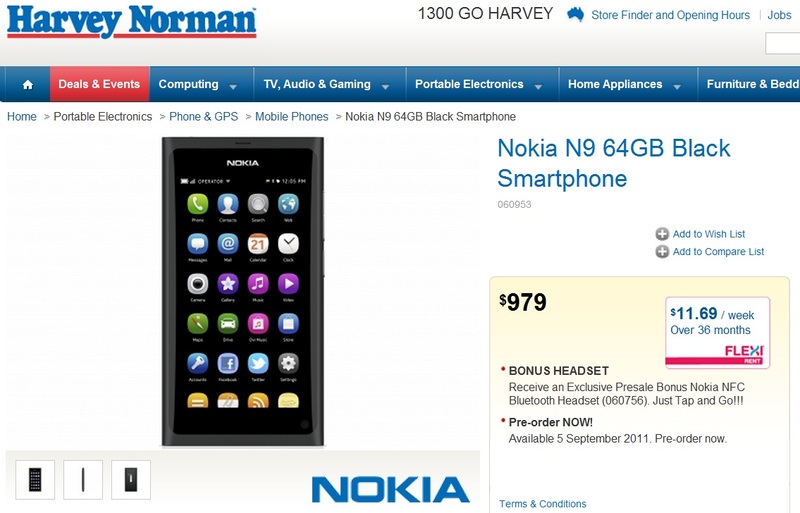 Harvey Norman, an Australian based retailer has got the Nokia N9 up for pre-order WITH an availability date of September 5th. Note, availablility for the N9 may not be at all regions simultaneously. For example, the N9 is expected in Sweden around September 23rd. 979 Australian dollars translates to 1013 US dollars, 711 euros or 662 British pounds. Should MobileFun stock the N9 they have it at a more affordable 519.95GBP. (I’m sure there are also other retailers with good prices for the N9, I don’t remember them all). Note also that Australia is getting the N9 on Vodafone, so for those interested in subsidized phones on contract you also have this option.